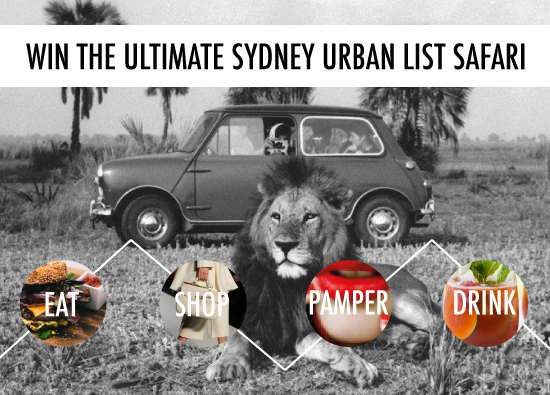 Sydneysiders, The Urban List has arrived and we're giving you the chance to WIN the Ultimate Sydney Urban List Safari! The Urban List is your curated, 'go-to' guide to the best local, boutique and independent restaurants, cafes, bars, clubs, health, beauty and shopping in Sydney. We've made a start, now it's over to you. Help us shape The Urban List by nominating your favourite local and independent places to eat, drink, buy, book and experience in our Emerald City. And you'll go into the draw to WIN the Ultimate Urban List Safari! You and a friend will be treated to the Ultimate Sydney Urban List Safari where you'll eat at the cafe, dine at the restaurant, drink at the bar, party at the club, shop at the boutique and indulge yourselves at the places voted BEST in Sydney! Once all the nominations are in, it will be up to you to vote for your favourite! Enter as many times as you like. Use our search bar at the top of the page to check if your nomination already exists, and if not NOMINATE NOW!